Rev. Andrew A. Bialas, CSV, died on Saturday, Aug. 26, 2000 at 2:55 AM at Resurrection Life Center in Chicago. He was 87. A native of Downers Grove, IL, Andy Bialas was born on Oct. 1, 1912, the son of John and Eve Bialas. He entered the Viatorian Novitiate in Sept. of 1936 and pronounced his first vows on Sept. 8, 1937. He received his B.A. in Philosophy from St. Ambrose College, his M.A. in Theology from Catholic University of America and his S.T.D from the Angelicum in Rome and he was ordained to the priesthood on May 21, 1944 in Chicago by Bishop Bernard Sheil. 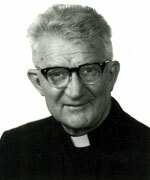 Father Bialas then began a long career as an educator. 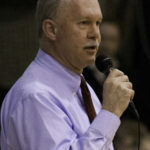 He taught at Catholic University of America, St. Thomas Seminary in Denver, College of St. Francis in Joliet, Barat College, the Viatorian Seminary and Marycrest College in Davenport, IA. From 1970-1977 he served at St. Mary Nativity in Joliet and from 1977-1981 served at Holy Cross Parish in Joliet while working for the Diocese of Joliet. From 1981 until 1998, he served as Chaplain at Shapiro Developmental Center and lived at St. Patrick Parish in Kankakee. For the past year, he has lived in retirement at Resurrection Life Center in Chicago. Visitation was held at St. Patrick Church, Kankakee on Tues., Aug. 29, 2000 from 4-8 PM with a Prayer Service at 7:30 PM. The funeral Mass was held at St. Patrick’s on Wed., Aug. 30, 2000 at 10:30 AM followed by burial in the Community Plot at Queen of Heaven Cemetery in Hillside. Father Bialas was preceded in death by his parents, seven brothers and three sisters. He is survived by his sister-in-law Mrs. Rose Beales (Bialas). Please remember Father Bialas in your prayers and gather in your local communities to remember him in Eucharist.